Where is it? : This wetland is off Oaklands Road adjacent to the Warradale Army Barracks and the Sturt River / Warriparri. Parking is available along The Parade West. Public transport is available on Bus Routes 241 or 248 (Adelaide – Marion Centre Interchange) alighting at Stop 22B on Oaklands Road. Property summary: Total area c. 7 hectares. Hundred of Adelaide – Allotments 1 and 2 (Deposited Plan 55941). 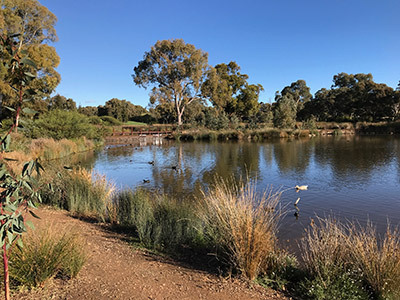 History: The Oaklands Wetland were completed in 2013. 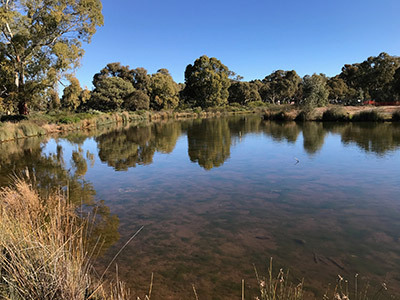 This project is a collaboration between the City of Marion and the Adelaide and Mount Lofty Ranges Natural Resources Management Board, with additional funding from the Australian Government’s ‘Water for the Future’ program. Habitat: The area has many old River Red Gum (Eucalyptus camaldulensis). Another 85,000 new plants have been planted including various sedges and other water loving species. Other species planted include Golden Wattle (Acacia pycnantha), Gold Dust Wattle (A. acinacea), Lagoon Saltbush (Atriplex suberecta), Berry Saltbush (Atriplex semibaccata), Sticky Goodenia (Goodenia varia) and Twiggy Daisy-bush (Olearia ramulosa).